I recently received an email letting me know of a much anticipated visit to Birmingham of a certain Connecticut gardener, Douglas Thomas. 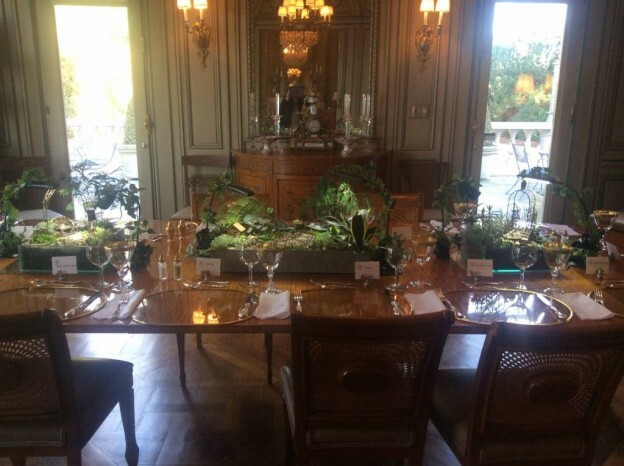 She was coming on the invitation of a friend and member of one of the oldest garden clubs in the city, and, to celebrate her visit, a joint meeting of two Garden Club of America groups had been arranged at the Birmingham Museum of Art. Through an arbor…the cat wants the goldfish in that bowl! Douglas Thomas is only the third owner of Twin Maples, a beautiful 400 acre estate in Connecticut. She would be in Birmingham in early February speaking on it and of the 40 acre meadow that she and her late husband, Wilmer, created with the help of noted Pennsylvania landscape designer Larry Weaner. In 2011, the Foundation for Landscape Studies awarded her their Placemaker Award. See the link HERE to read more about this award. Delving more thoroughly to learn more before going to hear her speak, I came across a New York Times article from 2008, which described the meadow in their headline as “The Natural Look, With Much Effort.” This phrase could certainly be applied to any garden I thought, including miniature versions! 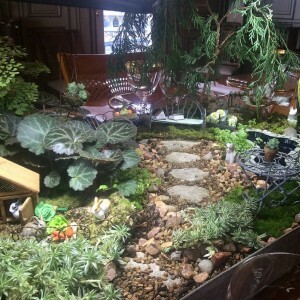 These particular miniature gardens had actually been created two years earlier for another eventful gathering, and, due to the owner’s exceptional care, many of the original plants were still thriving. The chamaecyparus “trees” had grown (Just as real trees do! 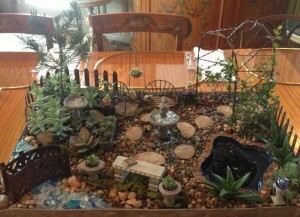 ), and the succulent landscape around one of the ponds only needed a bit of pinching back. Still, there were areas that needed fresh “landscape” plantings. 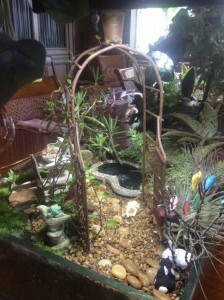 Some of these new plants included the addition of a fresh angelvine climbing on the arbor and air plants at the entrance to the succulent garden. 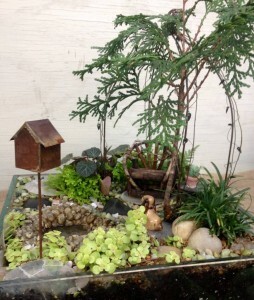 In another, sedum ‘Ogon’ was added near a pond as a “groundcover”. 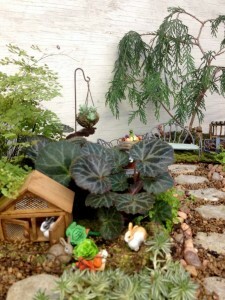 More tiny ferns and some selaginella were added to the existing tiny leaved maidenhair fern in the largest garden, and beyond it a strawberry begonia was planted to frame the rabbit hutch. 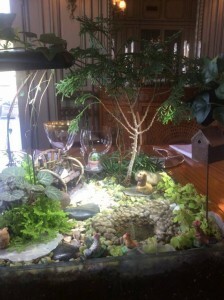 Great care was taken to place plants with like water needs together. With careful attention all of the “hardscape” paths and placement of small pieces were redone for each garden, and some redesigning of certain areas was accomplished as well. This takes a good bit of time and a lot of patience, but, above all, it’s quite a bit of fun too. It really is exactly like laying out a real garden, with decisions of where the paths need to be, what materials they should be made from, what they lead to, and more questions needing to be answered to make it realistic. Scale of materials is very important too and can be difficult to accomplish, but it makes all the difference! 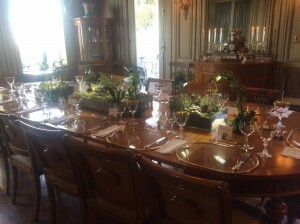 I received a phone call from the hostess the morning after the dinner party. “Your ears should have been burning,” she said. “They were a hit! Everyone enjoyed them, and kept finding new things the more they looked at them.” What a compliment, and how kind of her to pass it on. 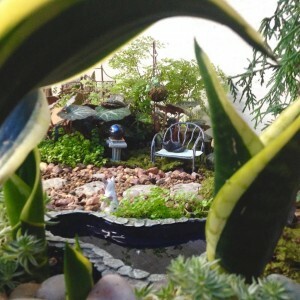 Take a look HERE for another post on miniature gardens, and type in “miniature gardens” in the search field for more. 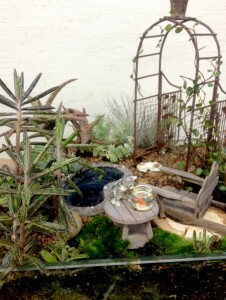 This entry was posted in Arrangements, Container, Indoor landscape, Miniature Garden, Succulents and tagged designing a miniature garden, douglas thomas, fairy gardening, larry weaner, miniature garden centerpieces on February 16, 2015 by Kris Blevons.